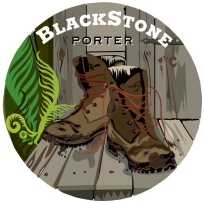 VICTORIA, BC – Driftwood Brewery has brought back their limited edition winter seasonal, Blackstone Porter, for another year, this time with a new label. With just enough dark malt to be black this Porter leans toward the dry side in its malt profile. The addition of a partial sour mash (not uncommon in pre-Industrial Revolution Porters) lends a subtle tartness to the bittersweet chocolate flavour that dominates. Blackstone Porter is available Wednesday at select private retailers in Victoria, and elsewhere in BC starting next week.